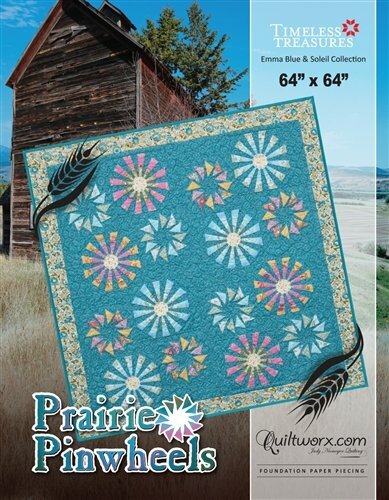 Prairie Pinwheels was designed as an introduction to a new series of patterns designed around windmills. Perhaps the most “efficient” design when it comes to fabric usage, this quilt requires less than 15 yards of fabric, INCLUDING the backing! This efficiency is due to the use of extremely well thought out cutting templates for the circular pinwheel, and no cutting at all for the spiked pinwheels. The spiked pinwheels are done using 2-1/2″ strips, which are strip pieced, then cut after the sewing is completed, to the perfect size. All other pieces are background triangles and rectangles, that are cut to exact size!